What is the most important thing when decorating a nursery? A good cot? An easy clean carpet? The newest sleep aid? No. Nursery themes and colours are a hot topic amongst parents-to-be aiming to balance style, comfort and function so everyone can sleep soundly at night. To make sure you don’t miss a thing, follow our tips for decorating as you put together your baby’s room! Meet Norah. Our newest (loudest) arrival. Parents are no longer limited to the traditional pink or blue. It is a lot of work to try and decorate your home with children running under feet, so you want to pick a base theme and colour that is versatile. On a whim in my son’s room I created a dark red, geometric feature wall which was visually striking but made a small wall even smaller. Instead go for a neutral background and décor, mixing in bright age-appropriate accessories, so you won’t need to redecorate every few years. That, or choose one theme and run with it. When designing baby Norah’s nursery, I got lots of ideas, designs and inspiration off Pinterest, wanting a child friendly not childish room that offered a peaceful environment for rest and play. With the demands of a newborn, most parents need calm more than anything. Go for a nursery design which reflects your style and the decor you’ve chosen for the rest of your home. We chose a gender-neutral shade, Valspar’s most popular simple, calming tone ‘Rabbits Foot’ from their cream colour combinations range. On the wall it has an almost purple, pastel, mocha-with-cream appearance that is 100 times better than your usual Magnolia base. Use a colour wheel for guidance but remember use your personality to dictate your scheme. The ‘Rabbits Foot’ shade blends perfectly with both Greys and Mustards for a Scandi-style feel. To add depth to the room and some warmth to the lovely light space we partnered up ‘Luxe Grey’ creating a much subtler feature wall. Over the fireplace we added golden polka circles for an easy, unique vinyl wall artwork. They are inexpensive, removable and add fun and sparkle to a room. When is the best time to decorate a nursery? Ideally well before baby is due (guidance says a minimum of 8 weeks) so the paint has time to dry and the room has time to ventilate. If you are pregnant you need to be careful with lifting, going up ladders the usual health and safety malarkey. Avoid adrenaline-fueled furniture-moving escapades even if you’re nesting vibes make you want to build flatpack at 2am. Decorating works for us now when Norah is 3 months, being more settled, to have the room ready for her to move into at 6 months old! Avoid overbuying. For the modern decorator why not use an online tool to calculate how much paint you will need after using the Valspar virtual painter to get an idea if the paint choice will suit the room. Buying high-quality paint means better coverage; using less and spending less. Available at your nearest B&Q Valspar’s 2000 pre-selected colour pots of 1L, 2.5L and 5L are mixed in store in minutes! To ensure you are picking the perfect shade and make use of lightboxes to see how the colour looks on the wall in both natural and artificial light. The store assistants explained how the Premium Blend v700 is the perfect family brand, it dries within 2 hours (true-we found it touch dry in 1), saves time by combining both a paint and primer, is wipeable scrubbable and stain resistant (see our video testing this claim!) it also has a low splatter, so you won’t be washing paint from your hair for weeks. I wanted to try and incorporate as much as I could of my son’s furniture, the shelving, soft furnishings etc into Norah’s nursery. The existing Ikea pieces are black and white which is perfect for a baby’s sensory development as monochrome and high contrast offer positive visual stimulation. Alternatively stick to items from the same colour palette to the walls, that or complimentary contrasting ones. Regarding what you need in a nursery go minimalist, a wardrobe for clothes, bookshelf, vintage toy trunk, a convertible cot, space saving change table (you could easily just use a cot change topper) and comfortable chair for those late-night feeds. You want a nursery to be practical and easy to use. Keep in mind the size of the room, how it will be used, for how long it will be a nursery, and design it to fit your needs. Add subtle colour pops to tie the room together, like the Mustard in this dreamcatcher and play mat. Create a safe zone around the cot by positioning it away from windows, heaters, lamps, wall decorations and cords. Use blackout blinds. Keep furniture that your baby could clamber onto away from the cot and anchor any lightweight items to the wall. Maximise the floor space to make room for play. Figure out how much storage space you’ll need… then put in more! Pick soft lighting. Finally, think safety- if you have rugs fix them with double sided tape to floors to avoid trips with a baby in your arms. Create a look that is bursting with originality by mixing old and new. Watch our video to view decorating tips and the full room reveal! 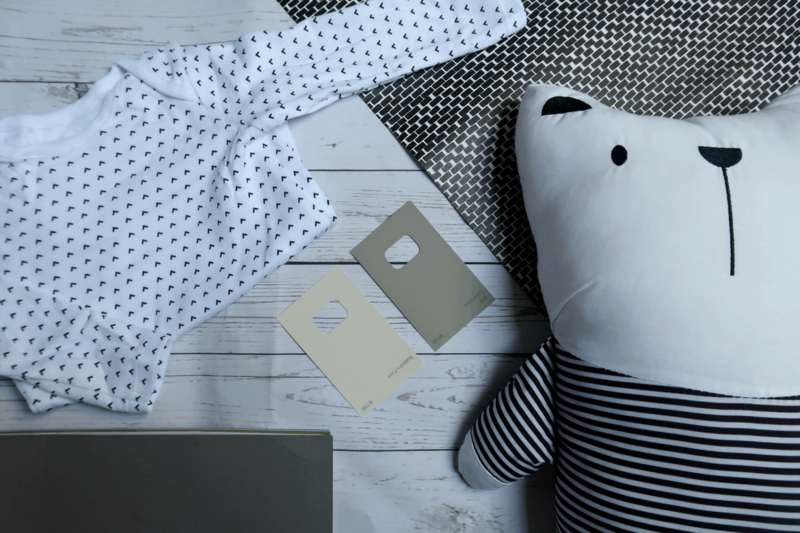 What do you think of Valspar’s Rabbits Foot and Luxe Grey colours in Norah’s nursery? Did you go gender neutral or themed? What colour will you be decorating your nursery? Note: This is a collaborative post, sponsored by Valspar. All thoughts and opinions are our own. Can I ask if you felt anything affected the colour of Valspars ‘Rabbit Foot’ for you? Like prior wall colour etc. I adore how the colour looks in your pictures, but, their promotional pictures are a completely different colour and the paint chips are completely different again. So far none of the Valspars colours have looked as expected and the inconstancy is driving me crazy. I’ve been waiting 2 weeks for a tester (supply issues) and really must start to paint tomorrow. In wondering if I should risk it. Sorry for the rant ? Your home looks like a showroom (but in a lived in, not sterile, way). You mega talented decor-guru you. Polka dots rock my world, might have to get some of those for my art room. I love all these useful tips on how to decorate a beautiful and more importantly practical bedroom. I will definitely make good use of my newly found decor knowledge! Thank you Jade for sharing your amazing sense of style! Some great tips and advice here wish I knew about all this stuff before mine was born ? very habdy to read for second time around though aand Norah’s nursery looks beautiful ? OOh its so lovely! I love the colours you have chosen and all the little touches- giving me so much inspiration for my new nursery. I think I will also go gender natural, was thinking of yellow and now I have seen that grey I think I might be onto a winner! Good read, i especially like the use of the gender neutral colours and only having to do one or two coats is a definite benefit! L Lovely restfull colour,grey is,never thought of using it in a bedroom,but i,m impressed it looks really nice.Love your poem in the picture too, and the name cushions on the cot. Looks like good paint nothing worse that lots of coats, we’ll definitely look to use this in our nursery Love the cat ears ! ? Interesting read, i do like the use of gender neatrul colours, and a paint that takes only one or two coats is a definite plus! Wow, the paint looks like it’s got really good coverage! I’ve been avoiding painting my living room (currently it’s just got lining paper up!) because I couldn’t decide on a paint and didn’t think I had the time. The Rabbit’s foot looks a really nice colour and hopefully will go with the bright colours in my room (think green piano, orange/red/yellow curtains, grey furniture!!) I’ll have to buy a sample when I am out next 🙂 Thanks for the posting the video too. There was some good painting tips in there! A really interesting post with lots of decorating-food-for-thought with my own newborn! Norah’s nursery looks beautiful. what a great article, the rooms you have done look amazing, love the colours and old and new furniture and features mixed together. makes me want to do some redecorating!